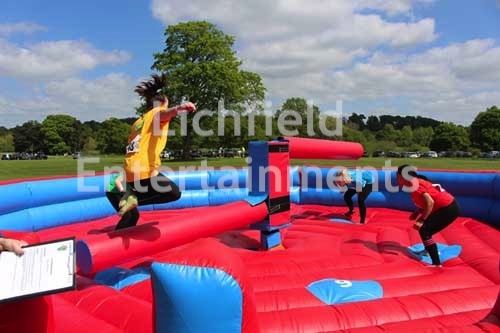 We have two different types of Last Man Standing Sweeper Arm games available: The pedal powered single arm version or the twin arm motorised version. This is brilliant Sweeper Arm game that instead of being powered by an electric motor is pedal powered! It can take up to eight participants at a time, plus the person pedalling in the middle. 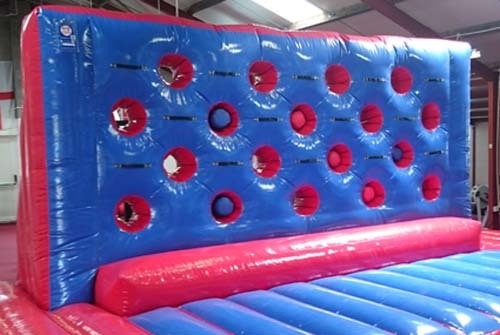 The eight players have to stand on their markers on the inflatable mattress and jump over the arm as it rotates past their marker. If you misjudge your jump and the arm hits you, or you're knocked over by the arm, you're out of the game. Last man standing wins. The rotating pedal station is situated in the centre of the inflatable mattress and this controls both the direction and speed of the inflatable sweeper arm - pedal forwards and the inflatable arm rotates one way, pedal backwards and it will go in the opposite direction, go fast, go slow, constantly vary it to keep the participants guessing. As soon as we saw the prototype of this game we placed our order, it really is that good, so we we're the first in the country to be able to offer this fantastic game. 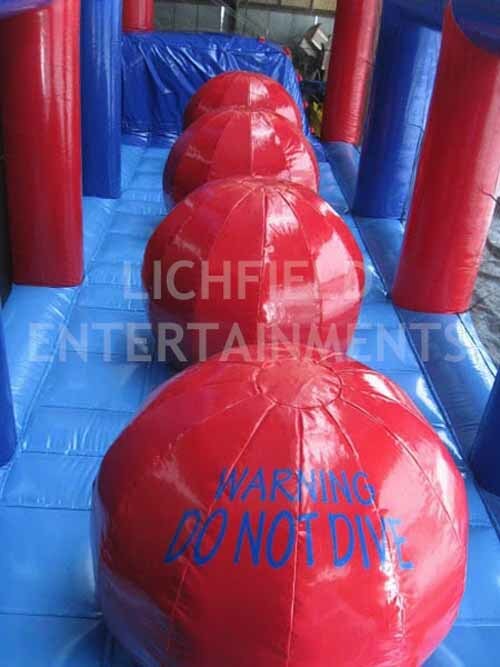 It can be hired on its own or as part of a package of games for fun days and fetes while also making a great team building game. Brand new for 2016 is the twin armed electric powered sweeper arm. This version has one arm to jump over and another to duck under so there's time to relax as the two arms rotate. Also worth a look is our brilliant BIG RED BALLS that go perfectly with the Sweeper Arm. The pedal powered sweeper arm game requires an overall operating space of 35x35ft and the motorised version 30x30ft. Both require a height clearance of 10ft if the event is being held indoors. Both Sweeper Arms are supplied with trained staff who will run the game for you, ensure its safe use, and even provide the pedal power if required. If you have any queries, questions, or would like to hire the Sweeper Arm for your event please call us on the number below or click to enquiry and we will do all we can to help. Click here to see our brilliant BIG RED BALLS and the SUCKER PUNCH CHALLENGE that both go perfectly with the Sweeper Arm.